European Union countries on Monday overruled France and gave the green light for Brussels to open trade talks with Washington as soon as possible and defuse trans-Atlantic tensions. The EU's 28 member states had struggled for months to agree on a mandate to open the talks, with some fearing the delay would restart a trade war with U.S. President Donald Trump. But EU ministers meeting in Luxembourg approved a mandate to negotiate "an agreement limited to the elimination of tariffs for industrial goods only" and another accord designed to remove non-tariff barriers. 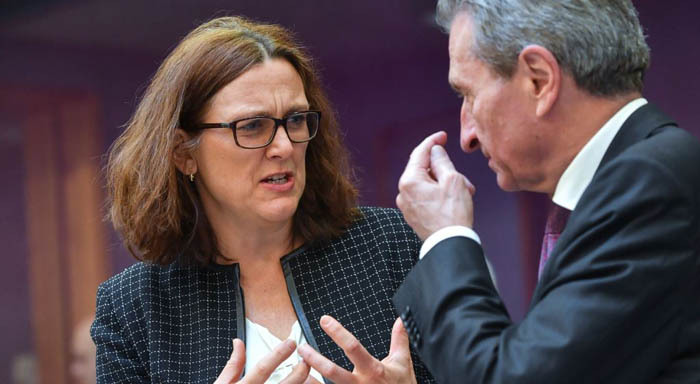 The ministers said the mandate would exclude agriculture products, which EU trade minister Cecilia Malmstrom said amounted to a "red line" for Europe. U.S. officials have pushed for farm products to be included. "I will now get in contact with our American partners with a view to organizing a date for the first round as soon as possible," Malmstrom told a press conference in Brussels. "If we agree to start, I think it can go quite quickly," the Swedish commissioner added. Malmstrom underlined the determination of the European Commission, the EU's executive arm, to finish the talks before its five-year term ends on Oct. 31. EU sources said France voted against the mandate and Belgium abstained during the Luxembourg meeting. Pursuing a limited trade deal is a key element of a truce negotiated in July that came close earlier this month to imploding after the U.S. threatened $11 billion in fresh trade tariffs against Europe. Paris voted against the mandate over worries about domestic blowback just months ahead of European elections, set for May 23 to 26. French President Emmanuel Macron has insisted the U.S. first sign back up to the Paris climate accord after Trump dumped the pact in 2017, infuriating Macron. But only a qualified majority of EU members was needed to support the talks, meaning France's "non" remained largely symbolic. Greenpeace has called on the Commission and national governments not to enter into trade negotiations with any country that rejects the Paris climate pact. "EU-Trump trade talks would seriously call into question the EU's resolve on climate change," Greenpeace's Naomi Ages said, warning time was running out to prevent "climate chaos." In a bid to win France over, its EU partners agreed to insist on environmental guarantees during the talks with Washington. In another sop, they also made a specific mention that TTIP, a far more ambitious transatlantic trade plan that never materialized, be officially called "obsolete". The Transatlantic Trade and Investment Paratnership talks stalled following widespread protests in Germany, France and Austria over fears it would undermine EU standards on food and health. At France's demand, agricultural products are also off the table. Berlin wants the limited deal in order to placate Trump and avoid U.S. auto tariffs that would punish Germany's cherished exports. The mandate from the EU stipulates that the talks would end if the U.S. pursued more levies against Europe, including on cars. It also says the EU cannot conclude the negotiations as long as the metal tariffs remain. The limited deal concerns only industrial goods, excluding the automotive sector. Fishing is also included, but not agriculture, services or public procurement. The U.S. however insists its wants to discuss agriculture, while Europeans would like to include cars. Both sides will have to bridge the gaps before the start of talks. At a meeting last July at the White House, Trump and European Commission President Jean-Claude Juncker pledged no new tariffs following those on steel and aluminium. That peace was in danger earlier this month after the U.S. threatened to impose tariff counter-measures of up to $11.2 billion on a host of European products in response to subsidies received by aircraft maker Airbus. But Malmstrom said, "This is a welcome decision that will help ease trade tensions."